Like GWBush, I’m a bit premature in claiming mission accomplishment. 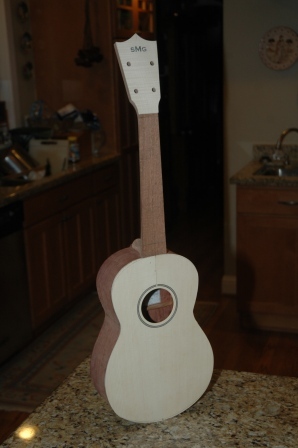 But, I have accomplished the major construction piece of my first uke. It’s a box with a neck. Before I move on to the binding install and the fretboard install, I’ll get back to Guitar 1001 which is awaiting the neck shaping before moving on to the finish work (water based lacquer finish). Heads down work today. After cracking a side, repairing and letting set, I applied a 15 foot radius to the back and glued on the kerf. A few hours later, I sanded down the kerf and glued the back on and secured with spool clamps (left over from my first guitar build). In another hour, I’m back down to the man cave to release the clamps and trim back the overhang. It should actually look like a uke. 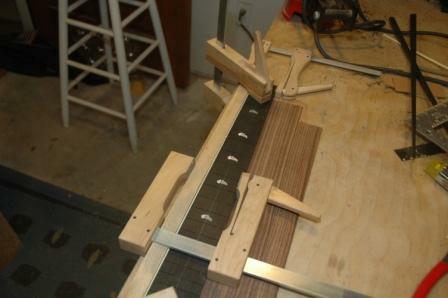 The top is glued to the neck before attaching sides. The top nestles into the top of the neck, which is a one piece spanish heel design. 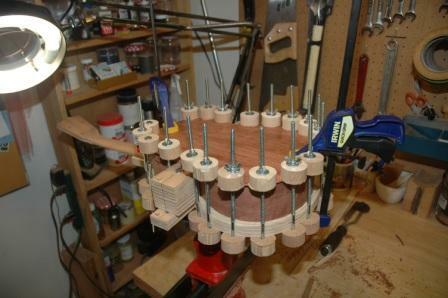 The top and neck are indexed with pins to keep the top from skating when gluing and clamping. 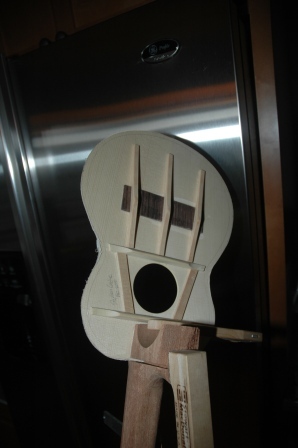 Once the neck and top are joined, the sides can be glued using a special workboard designed for the soprano uke using a spanish heel. 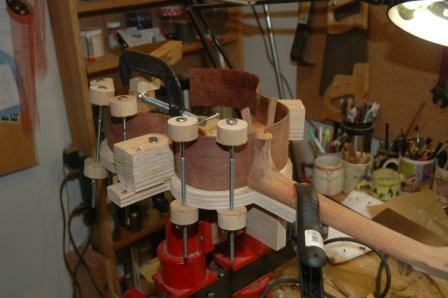 The top and neck are laid face down on the workboard, which has two waist clamps to push the sides together, into the spanish heel slots and against the heel block which has already been glued in place. After one side has been glued and clamped, the other side is installed. 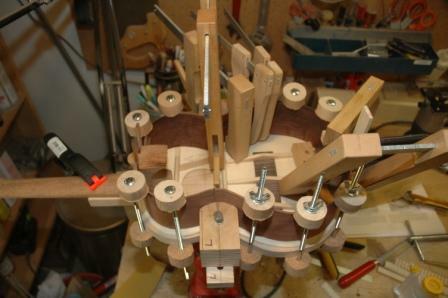 Spool clamps hold the sides against the top, and C clamps hold the sides against the heel block. 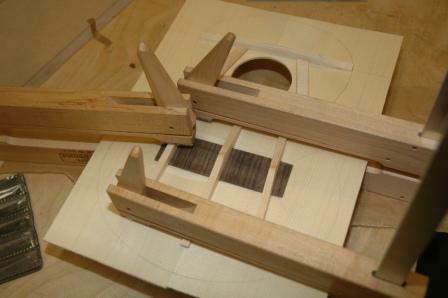 Kerfing will be added to secure the joint between the top and the sides. The braces and center patch for the back plate have been installed. The braces are radiused to 15 feet to give the back a dome shape. 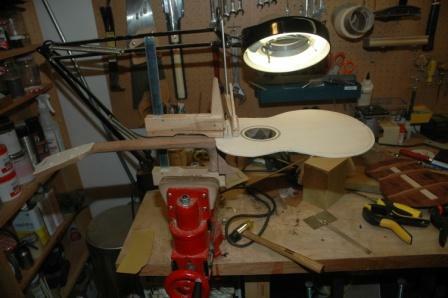 The top’s soundhole has been cut, and bracing, tone bar and bridge plate have been installed. 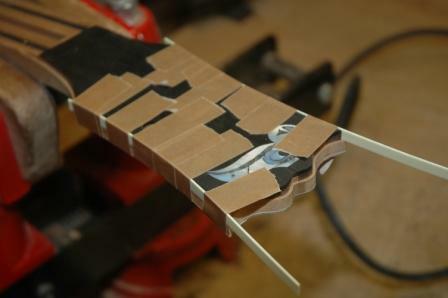 I’m binding the headstock and the fretboard with ivroid. 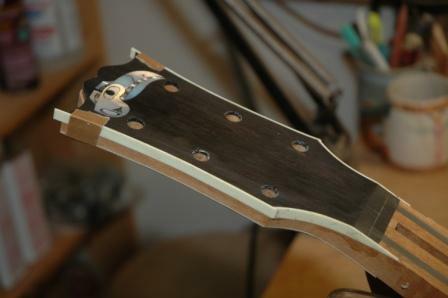 The headstock channel was cut with a router. 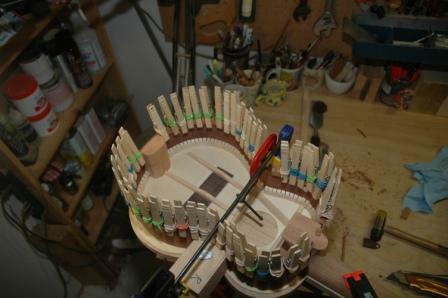 Ivroid was glued in in stages, first the sides, then the taper to the neck, then finally the top end. The ivroid needed to be heated and bent before gluing. The neck ivroid was installed after the neck was tapered. 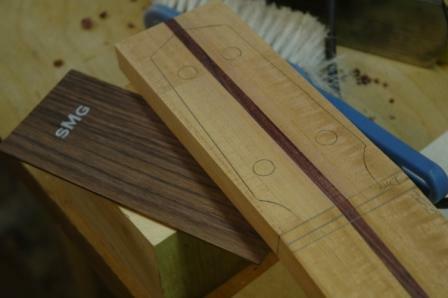 I continue to work on the neck for the hybrid guitar. The center lam strip has been installed. 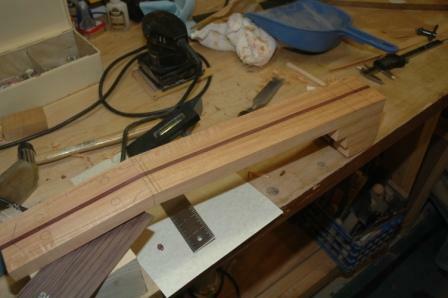 I routed out a channel to accept the truss rod (access will be through soundhole) and plugged up the neck end with a piece of mahogany. 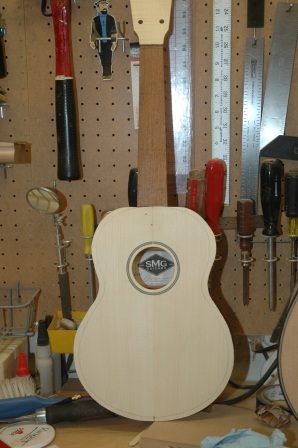 This piece has been trimmed down flush with the neck and headstock. Yesterday I installed a plugin on my blog which is supposed to feed my posts to my wall on Facebook. This way I can annoy additional people who don’t visit this blog and “reach a wider audience”. I’m practicing my social media vocabulary. What follows is a post I made yesterday before I installed the plugin to see if it really works. Today is a snow day, which means I don’t have to work! Work being teaching math at a high school. The power is still on, so my power tools and lights work down in the shop, and I’ve got lots I can work on. I’m juggling several projects right now, a koa dreadnought, a bubinga uke, and a new entry, a palo escrito hybrid with my first cutaway. I’m also supporting an intern who is working on a walnut OM. In addition, I’ve got lots of workshop organization and cleanup to do. 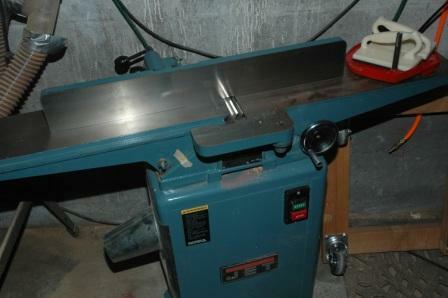 I introduced a new power tool into my garage; a planer. I moved the compressor to a temporary location to make room for the planer, merely delaying the inevitable; where do I put the compressor? Anyway, minor issues, lots of work available to choose from, and I’m damn excited. Snow Days Means More Guitars! 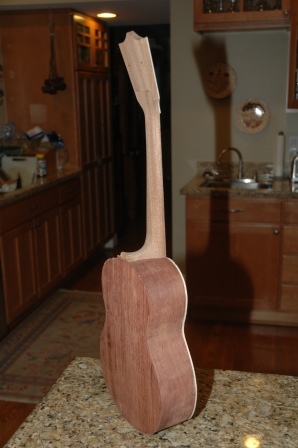 Jim challenged me as to whether this neck was cedar or mahogany. I mistakenly identified it as cedar but confirmed that it’s Honduran Mahogany. 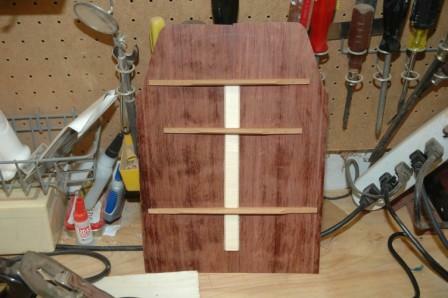 It’s lighter than the Sapele or African that I’ve used in the past leading me to misidentify it as Cedar. Mahogany it is. I’ve formed and installed a Camatillo center laminate strip. 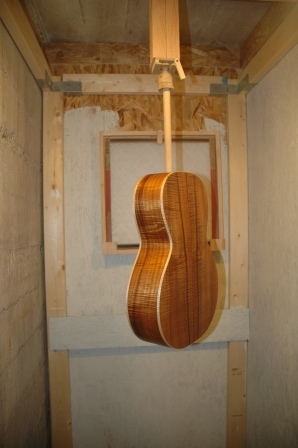 Camatillo is very red and should provide excellent contrast to the neck once finished. 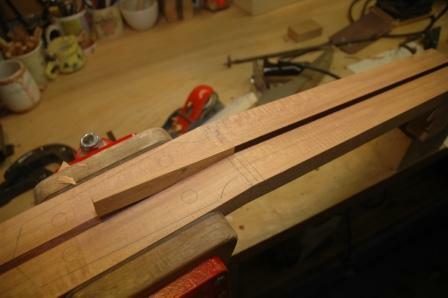 I created a softwood template of the headstock shape, which I used to trace over the headstock to check position. This view is from the top. 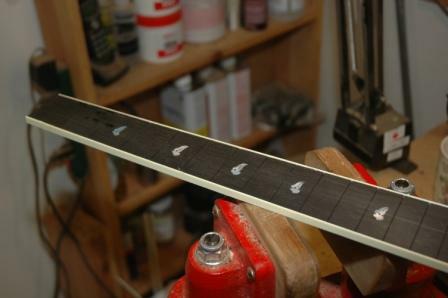 The lam strip will only be visible from the underside of the neck and headstock as the rosewood headplate and the fretboard will be installed on top.